Years ago, my first idea was rather simple: rent a small space for the Christmas month and then open a pop-up shop just selling Raspberry Pis. We didn’t really know why we wanted to do it, but suspected it would be fun! 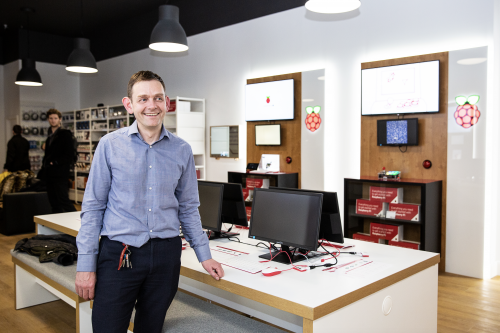 We didn’t expect it to take five years to organise, but last month we opened the first Raspberry Pi store in Cambridge’s Grand Arcade – and it’s a much more complete and complicated affair than that original pop-up idea. Given that we had access to a bunch of Raspberry Pis, we thought that we should use some of them to get some timelapse footage of the shop being set up. Uploaded by Raspberry Pi on 2019-03-22. 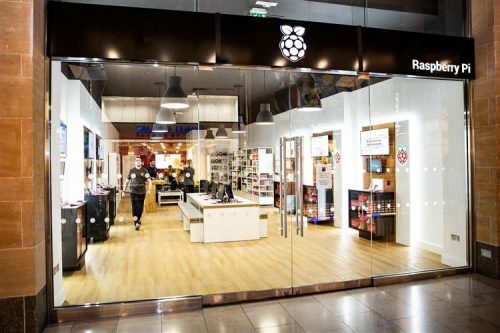 The idea behind the shop is to reach an audience that wouldn’t necessarily know about Raspberry Pi, so its job is to promote and display the capabilities of the Raspberry Pi computer and ecosystem. But there’s also plenty in there for the seasoned Pi hacker: we aim to make sure there’s something for you whatever your level of experience with computing is. Inside the shop you’ll find a set of project centres. Each one contains a Raspberry Pi project tutorial or example that will help you understand one advantage of the Raspberry Pi computer, and walk you through getting started with the device. We start with a Pi running Scratch to control a GPIO, turning on and off an LED. Another demos a similar project in Python, reading a push button and lighting three LEDs (can you guess what colour the three LEDs are?) – you can also see project centres based around Kodi and RetroPi demonstrating our hardware (the TV-HAT and the Pimoroni Picade console), and an area demonstrating the various Raspberry Pi computer options. There is a soft seating area, where you can come along, sit and read through the Raspberry Pi books and magazines, and have a chat with the shop staff. Finally we’ve got shelves of stock with which you can fill yer boots. This is not just Raspberry Pi official products, but merchandise from all of the ecosystem, totalling nearly 300 different lines (with more to come). Finally, we’ve got the Raspberry Pi engineering desk, where we’ll try to answer even the most complex of your questions. Come along, check out the shop, and give us your feedback. Who knows – maybe you’ll find some official merchandise you can’t buy anywhere else! Brilliant – glad you enjoyed it! We do try to make it friendly, and I’m glad that was your experience; I’ll make sure the folks who work there see your comment! Thus place is so cool… are there any thoughts for other locations? Made my first purchases at the Pi shop last weekend. Wish there was one on my local high street. Thank you for coming! Of course, if you and other customers keep coming and helping us make it a success, we’ll be able to look at other locations – so please come back! We’d love to see you. Oh how I would love to see a store here in the states. Fir now, I’ll have to settle for Micro Center. Yes. The Micro Center is awesome. I go to the Micro Center in Madison Heights, in Metro Detroit. You can buy a Raspberry 3B+ in store for under thirty bucks US. A Pi Zero W for 5 bucks! Amazing, the pi platform is so good for all age groups, I live in Wales and I am considering a day to to Cambridge to see this wonderful shop. Long live the pi. I want to open raspberry pi shop in my area. I am physics teacher. You guys should open a shop in New York City, the United States biggest city! This would help you guys reach a bigger audience then just the UK. So cool. Expect some day, there is a smiliar PI shop in my area. Hopefully the first of many Pi Shops?…..
Great idea for raspberry Pi shop. I have been looking for a Raspberry Pi with the two HDMI sockets but am having no luck. When and where will be the first one in the US? This side of the pond is Pi lonely. Do you wanna build a robot? Picade – the UK’s first Kickstarter project!